Recommended to: Readers who like ethereal reads that have one foot in reality and the other in magic. 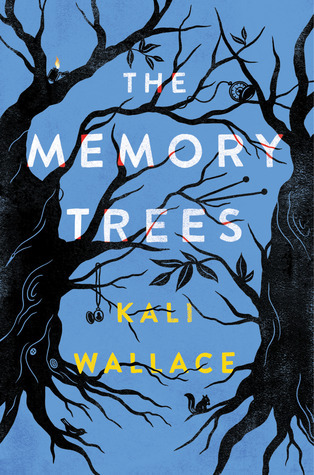 Alas, The Memory Trees falls on that odd line that I've found lately between something that enchanted me, and also left me slightly cold. I'll do my best to explain, I promise. It should be noted that I love Magical Realism. There's something beautiful about books that keep one foot firmly rooted in our reality, while exploring something otherworldly at the same time. In this case, I'm just not sure that Sorrow's story really accomplished that as well as I had hoped. At the core of this story is a deep family lineage that, as is often the case, is peppered with grief and loss. The Lovegood family has never had it easy. From the moment that the first Lovegood moved onto their ancestral land, their lives have been difficult and layered. I appreciated the fact that Wallace took the time to let the reader see the vast history that surrounded Sorrow's childhood home. It's easy to see how one event can echo through history, and even affect the present in ways that might not be completely obvious. The stories that were told rooted me in the Lovegood's lives like nothing else could. The downside to this way of writing though, is that it's rough to really settle into. Although I felt for Sorrow, and understood her anger at what she had lost, I couldn't quite step into her shoes and really become her. There were portions of this story that, while I could see that I should be feeling grief or hatred or anger, all I felt was a missing connection. It's a little tough to explain, but I felt like I was being told this story by someone far removed rather than someone who had actually experienced this. Additionally, I felt like the Magical Realism wasn't really coming through as strongly as it could have. There were small elements of mystery and magic, but they didn't feel as fleshed out as I would have liked. I wish I could have felt more of the magic that Sorrow was meant to feel. Try as I might though, it never stuck. As you can see, I'm of two minds about this book. The Memory Trees has great bones. The family history here is vast, and gives this book something that I'd been missing. It gives it roots. On the flip side, I never felt fully connected with our protagonist and that made things tough. What I can say is that the audio book version of this is definitely perfection. The narrator that was chosen has a voice that pins down that ethereal quality, and really brings the ghostly Lovegood family to life. So, my final suggestion is just to read this! If you're in love with rich familial ties, wide open country land, and stories that pull you into the life of someone unlike you, this is a book for you. FTC Disclosure: I received a copy of this book in exchange for a fair and honest review. I was not monetarily compensated for my opinion. Amazon link is an affiliate link, and I will receive compensation if you choose to purchase through it.